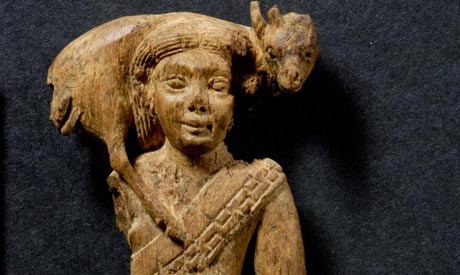 A German gallery was offering an ancient Egyptian ivory statue with a gazelle. The trouble is they did not do enough careful research to identify where the object came from, and if they had, they would have realised that an object surfacing on the market as recently as 2013 must be from an illicit source. So it was (Nevine El-Aref, 'Unique stolen ancient Egyptian statue to return from Germany soon' Al-Ahram Sunday 14 Jun 2015). The statue was discovered in 2008 in Aswan by a Swiss archaeological mission and was stored since in the Elephantine archaeological galleries. In 2013, the Elephantine galleries were subject to looting and the statue was stolen among other objects. At the time, the Ministry of Antiquities created a list of the stolen objects and put it on the red list of Interpol, in order to guarantee its return if it appeared in any auction hall or on the antiquities trading market. Date: Egypt, late New Kingdom to early Late Period c. 1100-600 B.C. Provenance: German Privat Colleciton, formed in the 60s to 70s., before American NY Collection formed in the 1930s. Object Description A fine, perfectly carved figure of ivory with Oryx on his shoulder. The body is twisted asymmetrical, the upper body looks straight ahead while the lower body in striding pose . A style made famous by the Phoenicians in the Mediterranean. Such decorative elements were symbols of prosperity in the early 1st millennium BC and were used mainly for exclusive furniture. This figure was probably found in 1900 in Egypt and came probably through trade or as war booty in the country. Some Phoenician-style ivories are solid plaques, while others are carved on one or both sides in a delicate openwork technique. Many originally were covered by gold leaf and inlaid with semiprecious stones or colored glass. Such rich combinations of ivory, gold, and brightly colored stones made the thrones of the Assyrian kings famous for their exquisite beauty. Phoenician ivory carvers were strongly influenced by the themes and style of Egyptian art owing to longstanding ties between the two cultures. Some Phoenician ivories illustrate purely Egyptian themes, but many use Egyptian motifs in entirely original compositions. There is also a cache (8th May 2015) of the page "highlights from the store", where can be seen "Important superb Ivory Figur with Oryx $5,108" which looks awfully like the Al Ahram's photo. Are these the same object? "A spokesperson from the ministry added that further investigations are underway to salvage another ancient artifact that was stolen from the Aswan museum, which is also now reportedly in Germany. No further details were issued regarding the second item" (Mada Masr, 'Egypt saves stolen ancient statuette from German auction house', Mada Masr Monday, June 15, 2015).